In my last post, I mentioned that I was nominated for some more awards (the kind you accept and pass along) but was too weak and disoriented to say much about them. Let’s fix that. 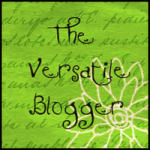 Aurora of Auroramorealist and Magnet for Foolishness nominated me for my 9th Versatile Blogger Award. 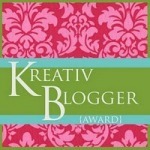 Aurora of Auroramorealist also nominated me for the Kreative Blogger Award and The One Lovely Blog Award. Being the “kreative blogger” I am, I’m going to make up my own rules for these awards (which probably have different versions of rules their own anyway). These rules will apply for all three awards, but just according to me, because I’m in a klever mood and I’m still on drugs…medications. Feel free to go back to the original award rules, which can be found somewhere. I’m sure you’re krafty enough to figure that out on your own. name the blogger who nominated you in your acceptance post, should you choose to accept the award. right click on the image of the award, and copy the URL of the image. Use the “Widget” Images on your dashboard to put the image on your blog home page so others know you’ve already been given this award. Say a little something about each blogger so readers know who they’re going to find when/if they check out the link you provide with their name. Let the nominees know you’ve given them the award. I’m passing. Nine times. If I was a cat this award was a life, I’d be at the end of my rope road. Thag at Mightier Than the Pen Here you’ll find amazing, funny, and thought-provoking flow-charts, Ven diagrams, and short essays. This guy’s brain in wired in a way that I admire. O. Leonard at WTF: What the Fluffy He can spin a yarn that will wrap you up and won’t let you go. Nostalgic, hysterical, and insightful. Gayle at Bodirose She is a poet of immense talent. Words are her paint brush. She makes the difficult job of writing memorable poetry seem simple. Chris at Christine Noels Together with her partner, Anton, she creates what I’m sure will one day be top-of-the-charts songs and videos. Their talent blows me away. Edwin at Awkward List If Jerry Seinfeld had a blog, this would be it. Jacqueline at The Mature Student Hanging in There No matter what challenge she faces, she faces it with grace, humor, and optimism. Amanda at Amanda: Alive All Along Here’s another woman who brings her unique sense of humor to her life or her observations about it. Nancy at Not Quite Old Her writing style and sense of comedic timing are superb. She writes about her life in a way that makes it feel like your life. Laurie at Sparky Laurie Her “Nuggets of Life” are heartfelt lessons in how to navigate your journey with a positive attitude. Her blog is always inspirational. Molly at Serendipity for Molly Her blog is about saving the world in her own gentle way. always give encouragement to others, by being a guiding light in the blog-o-sphere. give tirelessly to their blogs and posts by sacrificing their time and talent; sharing their deepest emotions, whether in words, art, photography, or another form. lend a hand to help fellow bloggers make their blogs even better. As a recipient I must to tell you why these two bloggers deserve this award. Isadora from Inside the Mind of Isadora is a blogger extraordinaire. Her posts–be they photographs, poetry, or prose–are a unique combination of magic, truth, hope, and playfulness. Only Izzy can create what she creates. I know she is active in her artistic community and she certainly is one of my reliable readers. Her comments are always supportive and insightful. She often acts my compass, helping me to gauge if I’m going where I should be going with my memoir stories. And she seems to know my destination before I do. I rely on her for inspiration in my “Comments” area and when reading her blog. Al from The Cvillean is one kind-hearted, witty, generous blogger (for a guy). Just kidding, Al! His blogs posts are a sure-fire laugh, so don’t eat or drink while reading his material; your computer screen will be a mess when you burst out laughing and other stuff bursts out, too. He has mastered the art of captioning zany pictures like no one I know, except for maybe, … well, … me. So I know how much time and effort go into all of his must-read posts. Al is quick with the wittiest of come-backs. His mind is sharp as an obsessive-compulsive fifth-grader’s #2 pencil (I’m remembering me again), but his heart is as soft as [insert softest thing you can imagine]. He cares. I know. He’s told me so. And he never lies. He’s told me that, too. You are so welcome. Talent like yours deserves to be recognized! Thank you so much! You are such a cool lady and your generosity and wit seem endless. Thank you for the nomination and thank you for introducing me to other great blogs! I’m so glad to have touched your heart in the way you’ve touched mine over and over! I am so very grateful for your nomination of the Rudolph Award. I thought you had awarded it to me because I had worn a red nose for a Christmas party I had attended. HAhahhhaaa …. actually, I thought of W.C. Fields and his red nose. I believe his was from drinking. I would need a lot of catching up for that to happen to me. I jest … Yes … because I am overwhelmed by your kind words. I have a lump in my throat and tear filled eyes. It is so nice to receive these awards but it’s more important for me to touch someones heart and make them feel more than they might be feeling for whatever reason. I truly had expectations of just writing about my heavy burdens when I started my blog and, then, found that I had lots of positive things to say and fun photos that might help others. I hope to continue to do that eveyday. I hope to make someone have a brighter day and feel special in whatever words I can. If I can make someone smile and feel that life isn’t so bad then I feel Zen. Life is no straight and easy road along which we travel free and unhampered but a maze of passages which we must seek our way, lost confused and now and again blindly. You made my day beautiful … my heart is very glad … !!! awww! I am glad you are feeling better and I love the drama 🙂 you always make me smile!! Please, please, please stay out of this bug’s way. I’m almost done with the antibiotics and it’s still hanging on. I feel better, but no where near healthy. And you’re humble, too. Are you real or a golden retriever with excellent typing skills? I meant everything I said and I’m looking forward to reading and laughing at whatever you have to offer all of us! Nancy, you deserve the congrats. Your blog is certainly worth a look-see! You are so very welcome, Jacqueline. I hope no more awards come my way so this will be the end of it for me–but not for you, I’m sure! Sounds about right. Enjoy celebrating! Thanks for passing on the Kreativ Blogger Award to me. What color wine goes with it? Maybe I’ll select a medium-grade rosé. 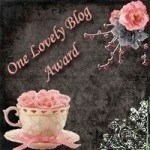 Congrats to you Lorna, and thank you for my lovely blog award! I will post it proudly and will definitely check out the other blogs you named. Eventually. Thanks, Lorna, for the nomination. And Congrats to you on your multiple wins! Hi Lorna … Good to hear you’re feeling better .. Congratulations on the Awards you’ve received … you’re worth it! Thanks for gifting me the ‘One Lovely Blog’ recognition, an honour to be sure! First off, Lorna, I’m glad you are feeling better and back amongst us. When a prolific blogger like you goes down it’s leaves a pretty big hole in our daily lives. Welcome back. Secondly, I am humbled by the award and praise you gave me. Blogging is fun and I would do it just for that reason. But when someone appreciates the effort like you do, and says so, it really lights up the day. Thank you. When I first read it I wondered who this Al guy was. Then I tumbled. “Wow, she’s talking about me!” As I say in my “reasons I love blogging” page on my site, much of what I do I learned from you. If it doesn’t hurt your aching muscles too much, reach around and give yourself a little pat on the back from me. Well, you’ve put the pressure on now. I’m just hoping a lot of funny things happen in 2012 now. Wait, what am I thinking, it’s an election year. These blogs will write themselves! Excuse my manners. Glad you’re feeling better. That bug is huge and is down south as well. I’m pretty lucky, so far. Take care.